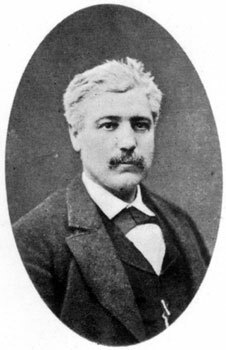 The booklet featured here in its entirety on the IISH Website was written by Auguste Marie Fabre (1833-1922) in an era of widespread optimism. This sentiment, shared by many in France and elsewhere, may seem very remote today, especially if we recall the scenes of the destruction of the WTC on September 11, 2001. In 1896 the future looked very different, and Fabre wrote unambiguously in the last paragraphs of his booklet that "we are filled with admiration for the immense resources of modern industry" (p. 31). Fabre's booklet is part of a tradition of 19th-century idealists. In the United States efforts to implement the ideas of F.M. Charles Fourier (1772-1837) began very early. Well-known examples include the Brook Farm in Massachusetts (1841-1846) and the North American Phalanx in Red Bank, New Jersey. Étienne Cabet (1788-1856), who established the socialist commune Nauvoo in Illinois in 1849, was equally important in this respect. In the 19th century the United States was the land of freedom and unlimited opportunities for utopians, socialists and reformers, just as it had been for Protestant dissidents in the 17th century. The author of Les Sky Scratchers was born in the town of Uzès in 1833. Fabre, whose father was a preacher and a Fourierist, was orphaned at an early age. He was raised by a foster family near Nîmes and was an avid reader of Fourier's works from his father's library. He also inherited a silk factory at Uzès, which he later revived. As a young man Fabre was fascinated with the United States and the utopian experiments there. Unfortunately, he never managed to realize his plans to visit America. Fabre was a reluctant entrepreneur. Forced to take a stand during a labour conflict in Lyon, he closed his business. He moved to Nîmes and opened a workshop for agricultural equipment. He was also involved in parenting and education there. In 1876 he established the organization La Solidarité. Such clubs were called chambrées in Nîmes. His group consisted of about 15 workers who met in the evenings for discussion and instruction. Based on this organization, in 1878 he established a workingmen's consumer cooperative (which he named La Solidarité as well) with 30 members. Around the same time he also opened his cooperative bakery La Renaissance. In 1879 Godin asked Fabre to handle administrative matters concerning the Familistère in Guise. The Familistère was a cooperative experiment based on Fourierist ideas. The workers shared a residential complex near Godin's factory, which was what Fabre envisioned when he later learned of the skyscrapers in the United States. He remained in Guise as both a worker and a director of economic affairs until 1883. During this period he drafted the articles of association for Godin's brainchild. Upon returning to Nîmes, he focused almost entirely on the cooperative cause. During these years he worked extensively with Éduard de Boyve, who founded the general cooperative l'Abeille Nîmoise in 1884, and with the economist Charles Gide (1847-1932). While the fact that Gide was also born in Uzès may be sheer coincidence, it is certainly significant that all three men were Protestant and founded the French cooperative movement, and more specifically what became known as l'École de Nîmes. This was the French alternative to the general cooperative based on the English Rochdale ideas combined with views from the school of old pre-Marxist French socialism. The drive to unite French cooperatives originated in Nîmes. On July 27, 1885 at the town hall for the 4th arrondissement in Paris, the first national congress of the Sociétés Coopératives de Consommation de France convened. At this event the participants launched the new journal l'Émancipation, which first appeared on November 15, 1886 in Nîmes. Gide and de Boyve expressed their views extensively in this periodical. Fabre contributed as well. In the first issue he signed his contribution with his name, followed by mécanicien. In his booklet L'École de Nîmes, Gide describes Fabre as a somewhat eccentric man who was an employer wanting to be in harmony with his workers. He was a freethinker yet also communicated with the other world through a young medium. He was a zealous reader and interpreter of Fourier's work and lectured on the ideas of Owen and Godin. And, as mentioned above, he admired the United States and the social experiments taking place there. When Fabre wrote his booklet in 1896, the highest skyscraper was in Chicago. The Masonic Temple, built in 1892, reached a record height of 92 meters. 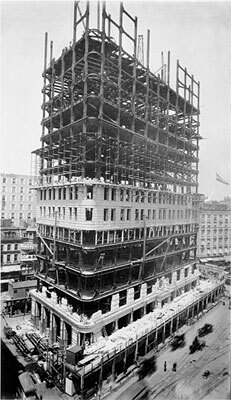 In 1913 the Woolworth Building in New York City became the tallest, at 242 meters. Technical progress in steel construction and the invention of the safety lift by Otis made the rapid ascent to the clouds possible. Fabre regarded "Les hautes maisons Américaines" not as the offices of capitalism but as an opportunity for better working-class housing in major cities. They enabled joint property through shares or a cooperative. They made possible size adjustments so that workers no longer had to keep moving. Heating was shared, as was refuse disposal through chutes. They were more sanitary, less susceptible to infections and safer than ordinary apartment blocks and tenements. They enabled an ever-increasing concentration in major cities that led to increased economic activity. Fabre was captivated by that image, and asserted: people feel small, and it seems as if giants are calling "Forward! En avant! En avant! Le progrès est dans la recherche des meilleures conditions de développement de la vie humaine et dans la poursuite incessante d'un idéal toujours plus large, toujours plus haut" (p. 31). (Forward! Forward! Forward! Progress lies in searching for the best conditions for the development of human life and in the incessant pursuit of an ideal, always bigger, always higher).